Note the unusual and beautiful paint pattern in the above close-up of the actual unit. 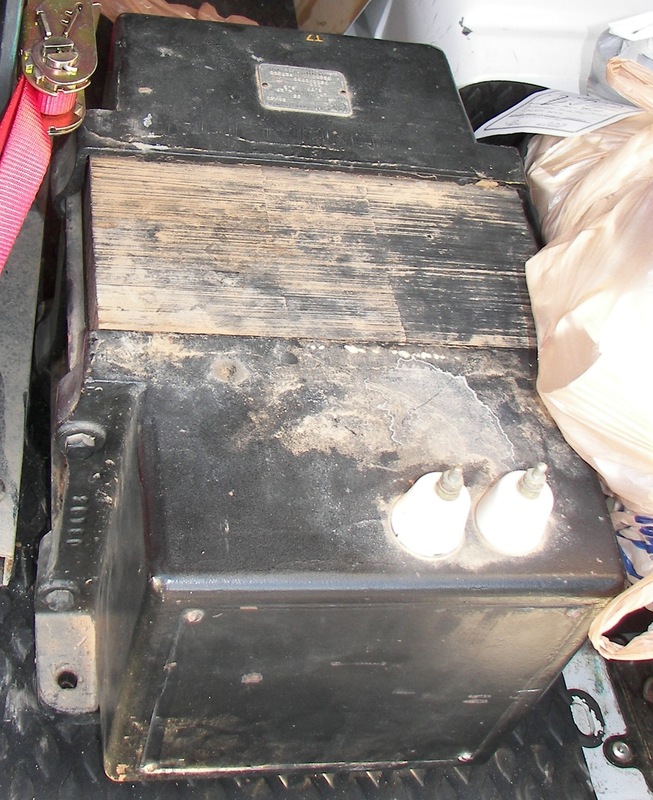 At some point, the very largest of vacuum-tube audio amplifiers seem to have faded away. Amplifiers like this, and larger, may have been used in vibration test (shakers), 1000-space drive-in theaters, stadiums, mains power frequency changers, and other applications. They may have disappeared to scrap yards, a few to hobbyists, and other places never more seen. It really is a tragic loss. In 2013 I was lucky to find the remains of an Unholtz-Dickie 2KW audio amplifier (made by Philips and re-badged) formerly used in shaker service. By remains, I mean that the chassis, covers, and the output transformer are recovered. The manual appeared on the WWW. That is enough, however, for dedicated hobbyists to go on. Below are some details and pictures. It is not a complete story by any means. It is expected to take at least two years to build this back into a usable, stable amplifier. Then it will be time to look into subwoofers. The output is 100VAC@2KVA, equivalent to a 5-Ohm load, and maybe various 100-120V equipment loads. The original configuration called for 208V/60Hz 3-phase power input. 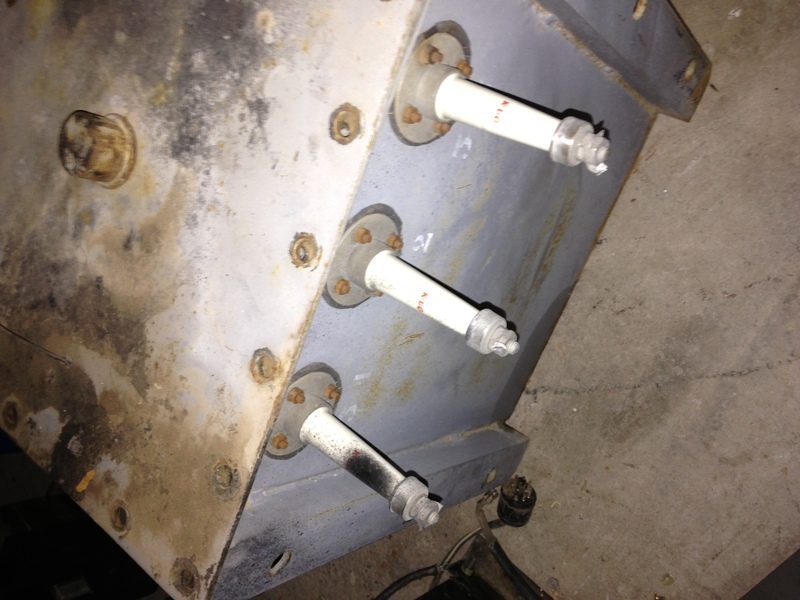 Six DCG4/1000 Mercury vapor rectifiers supplied 4750V to a pair of QB5/1750 tubes. A single phase transformer provided filaments, bias, and 700VDC via two DCG1/250 Mercury vapor rectifiers for the QB5/1750's EL34 cathode follower drivers and related voltage amplifiers. Here is a comment directed to the audio enthusiast public as well as makers of transformers. More Philips power amplifiers there. 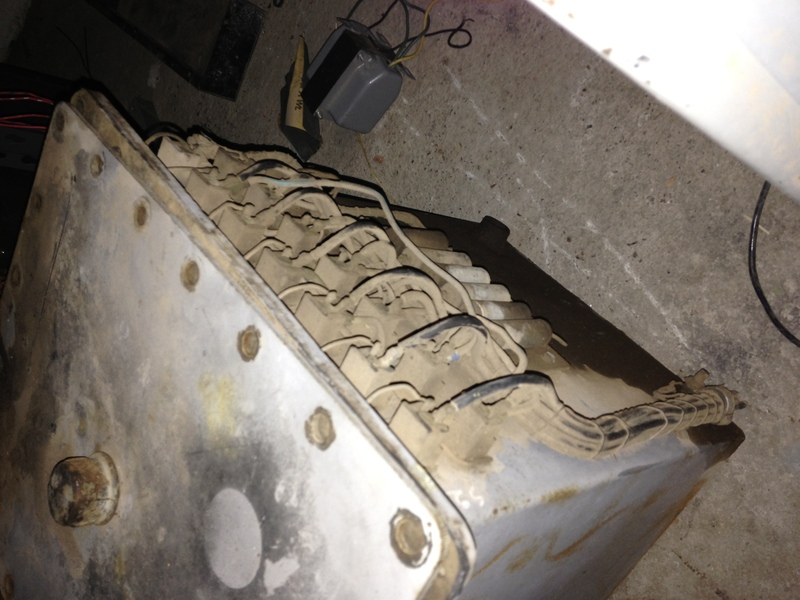 An Amertran 3.75 KVA transformer found with the unit. but is one possibility and is about the right electrical size. 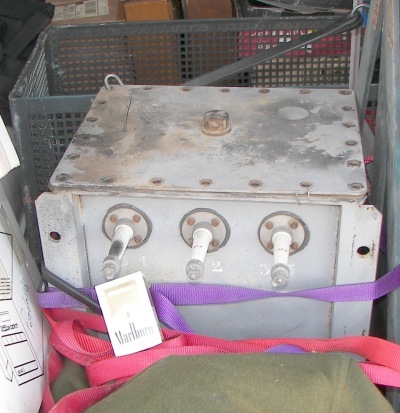 is from a military RF amplifier used with the BC-610 transmitter. 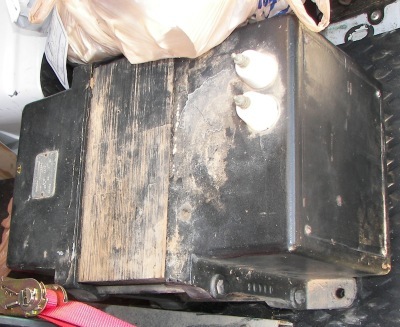 NEMA 5-50 (125V), or for the entire "stereo" with a 14-50 (125/250V) receptacle. about 40" (1010mm) tall, 27" (670mm) deep, 20.6"
some 540 lbs (245Kg). Casters are to be next. There are some here already. The upper cutout is for heavy IR-blocking glass. The lower is for the controls. Note that the top window is larger than in the service manual. and output transformer. Note the 3.375"/8.57cm cigarette pack for scale. it's more like the front of the thing is where the hot air will be generated! - From the Radiotron Designer's Handbook 4th Edition page 235. 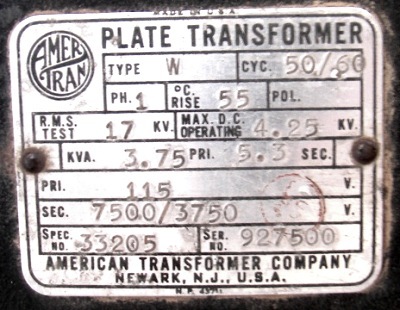 This transformer's core area appears to be about 9.6 square inches. It's an average guess from a couple people judging the photos. I have not had time to measure this yet. The core height is evident, but the width has to be observed carefully. Note the stitching-like marks where the laminations abutt. That indicates the thickness of the actual core from right to left. The value from the formula above is 2878VA. 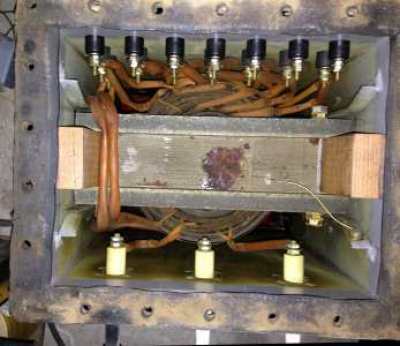 It must be taken into account that the steel in this audio transformer is probably selected for this application, that is to say, it is probably not the same steel usually found in power transformers of the types discussed in historical power transformer literature. In any case, there is at least 2KVA found by calculating from the averaged estimates of cross-section of the core. Once there's time to measure it, likely the answer will be closer to 2KVA, maybe even less because a better steel core need not be as large as a lesser one. 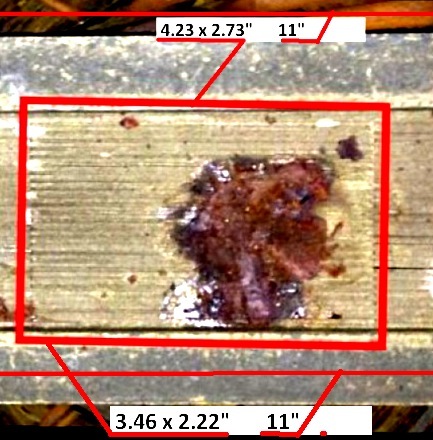 That is indeed an ugly-looking rust stain, but it pretty much wiped right off. Not as bad as it looks. Shell Diala BX was recommended.